I am really happy that India’s de-facto CIO – department of electronics and information technology (DeitY) secretary RS Sharma – has started to talk about dematerialisation (demat) of various government certificates, issued to individuals, across the country. Speaking at a Governance Now roundtable recently, he pointed out that his department is already working towards a formal launch of citizen digital locker (‘DigiLocker’) that would enable them to store all government issued documents – from birth certificate to educational certificates, PAN and passport – on the cloud. The scanned documents thus stored can be accessed by using their respective Aadhaar numbers. Eventually, Sharma wants these certificates to get dematerialised. This is an important step that will not only create a need for people to adopt IT at a personal level, but will also trigger the much needed backend government-to-government process restructuring and automation that is vital for building a Digital India. Going by India’s history of adopting the system for the stock market, that switched to the demat format in 1996 following the enactment of the Depositories Act, it is not really a difficult dream to realise. India is reported to be the only country that achieved almost 51 percent of market capitalisation and 94 percent settlements in demat form in less than three years. It is important to note that the voluntary dematerialisation of financial stocks in India started in December 1996, nearly six months after the Sebi (Depositories and Participant) Regulation was notified in May earlier in the year – the National Securities Depository Ltd (NSDL) started functioning in November 1996, while the Central Depository Services Ltd (CDSL) commenced business in February 1999. Currently, according to Sebi’s 2014 year-end report, the total number of demat accounts in the country stands at 2.3 crore. According to a Sebi report by MT Raju and Prabhakar R Patil in March 2001, among the emerging markets studied by the two, India made the quickest progress in terms of adopting the dematerialisation in the stock market. “Except for UK and Hong Kong, India’s progress is unparallel. Countries like USA and South Korea have taken 27 years to achieve the level of growth of India,” the study said. So what does this have to do with the larger e-governance agenda and citizen service delivery? Let us take a few examples to understand this. As a developing economy with a population of 1.2 billion, India occupies a unique and special place in the global skilling ecosystem, more so as the World Bank estimates that the average age of the country’s population will be around 29 years for the next six years. Further, the Census 2011 data also indicates that by 2022 India will have the maximum number of working-age population – 15 to 59 years – in the world. However, will India be able to truly harness this human resource who could contribute to the economic growth of the nation in a big way? A September 2014 KPMG-FICCI report on ‘Skilling India’ clearly states that nothing short of a revolution is required in skilling and the vocational education space in India, which has assumed critical propositions and might well determine the future growth of this country. According to the 12th five-year plan document of the erstwhile planning commission, while only eight percent of India’s working population is graduate, nearly 25 percent have had a formal education till the primary level, 18 percent have studied till middle level (VI-VII), and 12 percent have attended secondary level classes (X-XII). Of these only two percent of the workforce has any vocational training. The problem gets magnified manifold due to the mismatch between the aspiring youth and the kind of jobs available to them. Skill gap studies conducted by the National Skill Development Corporation of India (NSDC) also indicate the trend, something that is clearly demonstrated by the high rate of migrant population in Punjab. While the agriculture and construction sectors in Punjab have been going through a growth phase offering significant employment opportunities, not many locals are willing to take up jobs in these sectors. The result: there is a huge surge in Punjab of labourers from eastern Uttar Pradesh, Bihar and Jharkhand who have been hired to do the job instead. So how would the system work? Once the government decides to dematerialise the birth certificate, the first thing it should do is to link it with the JAM Number Trinity – jan dhan yojana (bank account), Aadhaar and mobile numbers. In other word, the moment a birth certificate is issued, a temporary Aadhaar number should get generated automatically for the child. This will need a change in the existing rules that mandates that only those above 1 year can apply for the card. Like in the existing norm, biometric data of the child will be collected only after the age of 5 years, and again after the child turn 15 years for issuing the final card. The card of the newborn should be linked to the parent’s UID number, which I assume would have already been seeded with the bank account details and, if available, the mobile number of parents. Simultaneously, an immunisation e-record should also be generated under the recently launched Indradhanush programme of the government that aims at 100 percent vaccination of children between 0-2 years along with the entitlement card depending upon the socio-economical status of the parent. This will help in multiple ways. It will ensure all children born after a cut-off date will automatically get enrolled for the unique identity number. This will help the government track the child’s well-being with regular alerts on immunisation and health tips being sent to parents (through SMS and personal contact programmes). Since the government is already in the planning phase to implement the National e-Health Authority (NeHA) to serve as the integrated health information system this will be an easy task to achieve. The effort will also enable the state to keep a track of all children due for primary admission under the Right to Education Act, including their entitlement in terms of reimbursement of fee (a new set of cash benefits), scholarship and special financial assistance like the Delhi government’s Ladli scheme for the girl child and benefits under the Integrated Child Development Services (ICDS) programme. On the education front, the ministry of human resource development (MHRD) already has a memorandum of understanding with Unique Identification Authority of India (UIDAI) to bring schoolchildren under its umbrella and track their progress at every stage. The primary objective of this MoU that was signed in 2010 was to make the Aadhaar number an identifier on all performance records – from mark sheets and merit certificates, to transfer and migration certificates – and help prospective employers and educational institutions avoid fakes. Creating a repository to store these certificates in demat format will further strengthen the initiative and make tracking more efficient. Besides, once the government links all these data to a central manpower repository and maps it using a GIS platform, the country will have a powerful human resources planning tool in hand that will enable it to keep a track of students at each stage of their development curve, and even if they quit studies mid way. Top it up with smart data mining and analysis and the tool will enable the government do skill gap analysis in a real-time basis. This will help the policy makers address the issue faster and much better. 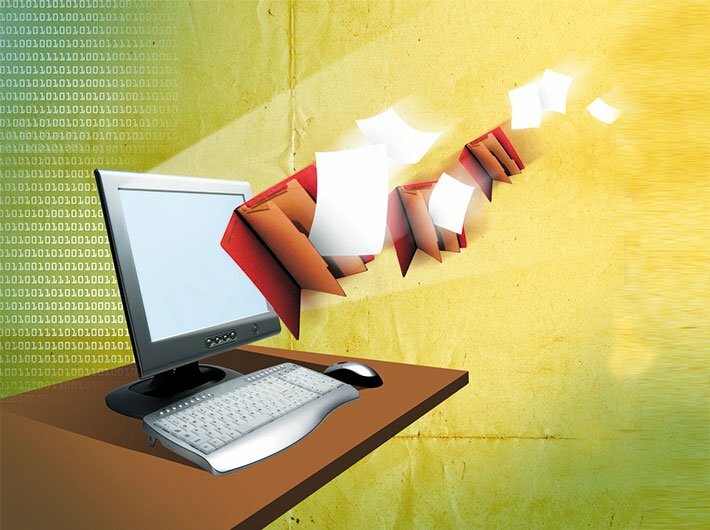 Going ahead, other records related to employment, achievements, investments, asset ownership – including property – legal and criminal records (if any) can further be dematerialised and added to the DigiLocker to create a system that will enable the nation plan, implement and monitor its various development programmes better – both for Digital India and Digital Bharat.